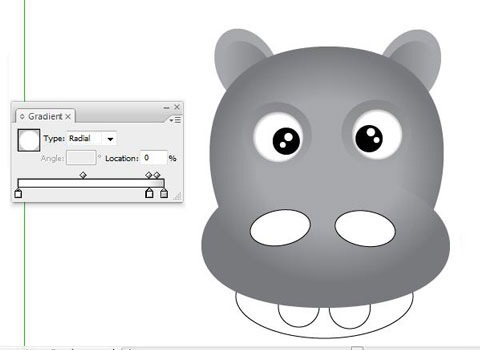 This is a great illustrator tutorial perfect for beginners learning illustrator, because it shows you how you can use illustrator basic tools in order to create cool cute character illustration design of an hippo using mainly only the ellipse tool and the gradient tool. 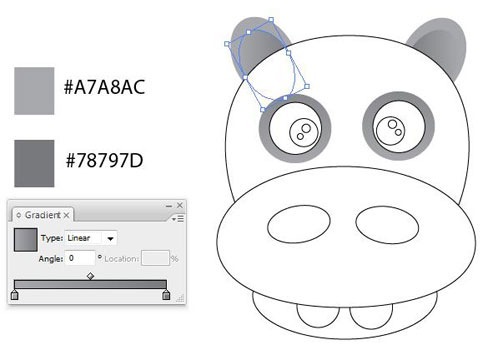 Ok So lets start off the tutorial by creating an new document within illustrator. 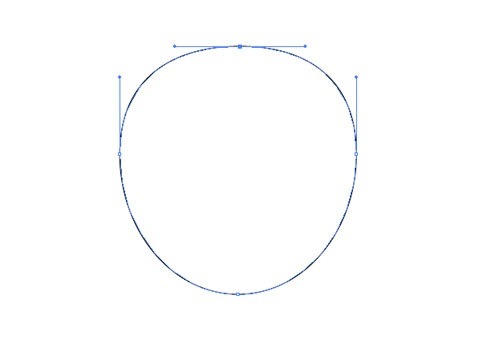 We then want grab the ellipse tool and create a circle, once the circle has been created select the direction tool to shrink down the top of the circle by dragging down the top anchor point. 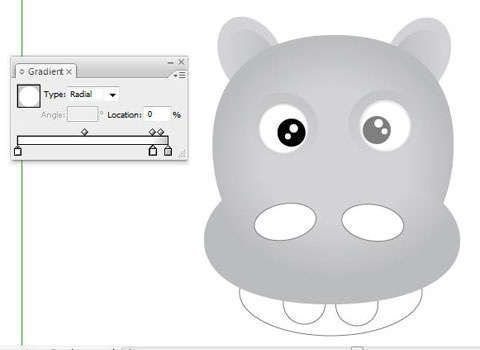 Then we want to start creating the nose for the hippo therefore we want to create another circle smaller than the current one we just created but wider, once the circle for nose has been created we then want copy the circle circle twice and centre the two circles we just created in to the middle of nose slightly rotating right circle a few degrees up right and the other circle a few degrees up towards the left. 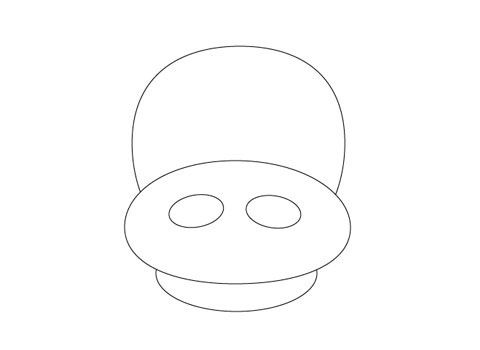 Then creating the neck is simple the circle we created for the nose we want to copy it and paste it then put it below the nose, sending that specific layer to the back by right clicking on the circle arrange > send to back. 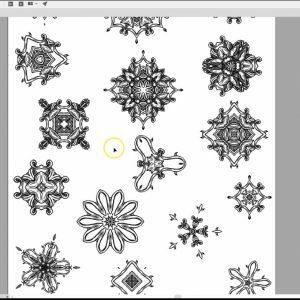 Now to create the eyes all we want to do is create it using the ellipse tool and position the circles like how its shown below in the screen shot. All what’s left to create before adding any color is the ears and the teeth. 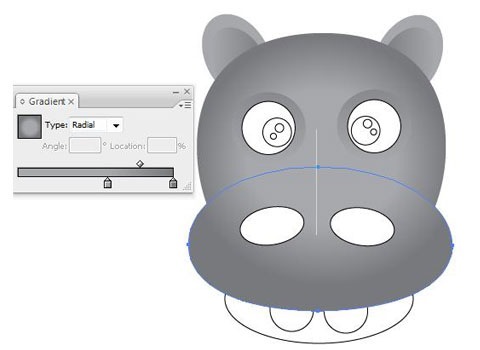 To create the ears where just going to create two circles one circle bigger and another circle slightly smaller then position the small circle inside the big one, refer to the screenshot below to see what ear for hippo should look like once you followed the previous steps. 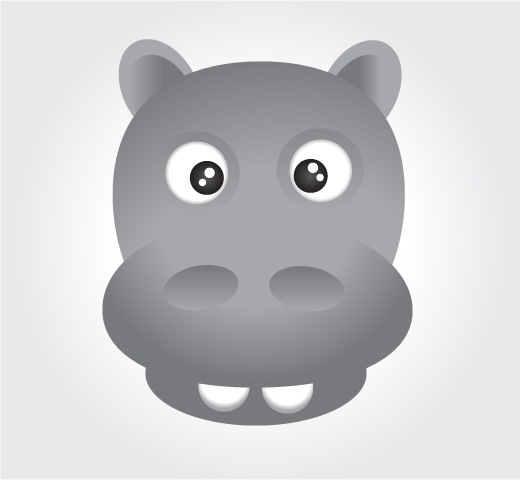 To create the teeth create two circles and send it behind the nose by right clicking on the two circles and selecting arrange > send to back. 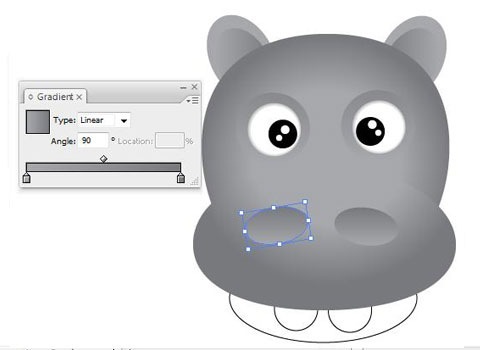 The position of teeth should look similar to the screen shot below. So lets start by adding colour to the design to bring it alive. 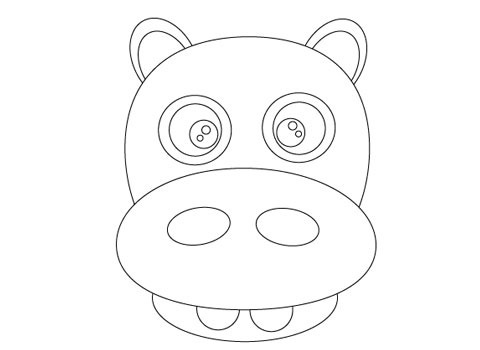 Where going to start our way at top adding colours to ears first then to the head, eyes nose and mouth. 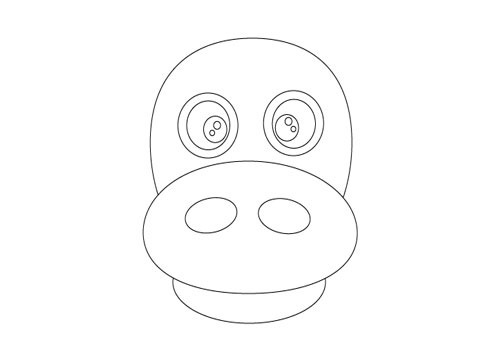 So select the larger circle and fill it with a light grey #A7A8AC and take stroke off the circle. Then we want to add a gradient to the inside circle of the ear and outside circle of the eye we the want the gradient to start of with a light grey #A7A8AC and finish off with dark grey #78797D then apply the gradient to the circles. 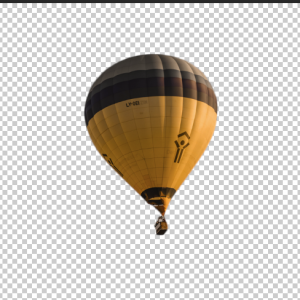 Now we want to add a radial gradient to head taking the stroke off first, the gradient we are going to apply to the head we will also want to apply the same gradient for the nose we are using the same colours which we previously used but this time we are going adjust the gradient sliders like shown below in the screenshot simply just dragging down the gradient tool. Now we want to finish off the eyes the by adding colors within the eyes we want the circle within the eye to be a radial gradient start of as white fading into a grey adjust gradient like shown below in the screenshot. The next circle within the eye we want to be a pure black with the smaller circles within that circle being white. 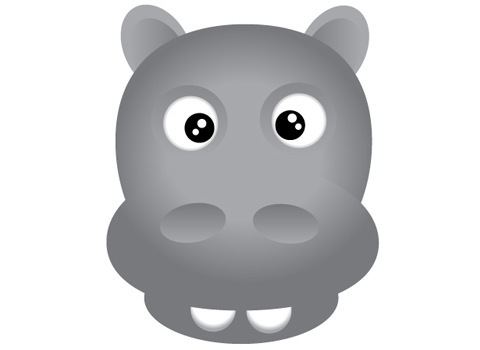 The next step is to add a gradient to the two small circles which are the hippos nostrils, ok so we want the gradient to start off as a light grey #A7A8AC and finish off with dark grey #78797D taking the stroke off and adding a linear gradient angle of 90 to the circle. The last part is adding a fill to the last circle a dark grey #78797D. 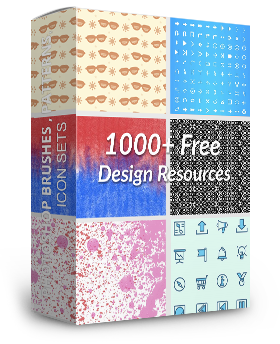 cool tutorial, nice outcome… thanks for sharing. Good tutorial, and so easy to follow. Lovely outcome! Good tutorial. You could probably make a part 2 to this on adding even more detail. Great work. 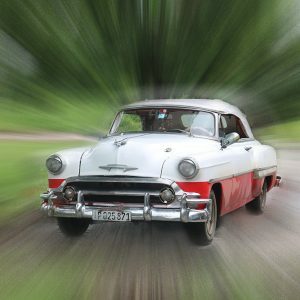 @Matthew Heidenreich – Nice idear thought never thought about following up the tutorial with a part 2. Cool tutorial. 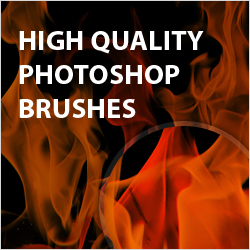 I like how gradient tool is of great importance in drawing and adding the final touches. This is a really fun tutorial! Thanks for sharing. I conceive this site has got very great indited articles articles.